Home to iconic landmarks like the Golden Gate Bridge, Alcatraz Island, Fisherman's Wharf, and the Chinatown district, San Francisco is one of the most beloved and historic shoreline cities in all of California. It's a vibrant, progressive place that has led the way in many fields of culture and society for decades now, always seeming to be one step ahead of the rest of the world. The Golden Gate Bridge and other aforementioned landmarks have come to define San Francisco and represent part of its persona and identity, but another key part of what makes the city special is its trolleys, or cable cars. San Francisco's cable car system, made up of manually operated trolleys that move along rails throughout the city, is actually the only one of its kind left in the world, with the cable cars themselves actually being classed on the National Register of Historic Places due to their cultural significance. 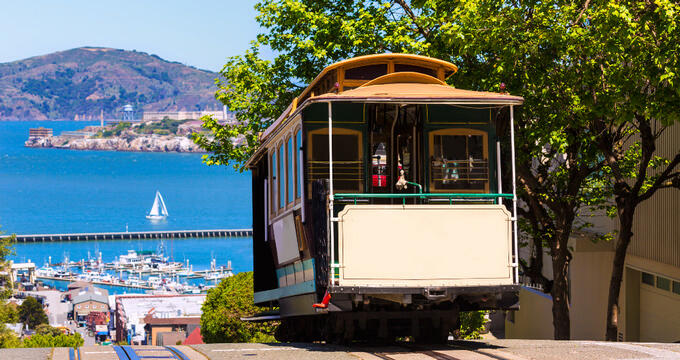 The San Francisco trolley system represents a fun, affordable way to get around the city, but has come to be seen as more than just a mode of transport over the years. Statistics show that around 7 million people ride the trolleys each year, and a huge percentage of that number are actually tourists who ride the cars as part of their 'San Francisco experience'. The trolleys are still used for getting around and fulfil their original purpose, but have taken on new life as an actual tourist attraction, with many people riding them just for the fun of it. If you're planning a trip to San Francisco and would like to ride the city's cable cars for yourself, read on to learn all about them. Historically, 23 separate lines have been established as part of the San Francisco trolley system throughout history, but only three are still used today. The lines are known by the numbers 59, 60, and 61. Line 59 runs from Powell to Mason, Line 60 runs from Powell to Hyde, and Line 61 Serves California Street and is typically known as the 'California Line'. In total, these three lines serve 62 stations, with over 20,000 people riding each day. The trolleys on the California line are larger than those on the other two lines as they feature a double-ended design rather than the single-ended design seen on the others. 12 double-ended cars run along the California line, while 28 single-ended cars run along the two other lines. The California line is the shortest, at 1.4 miles in length, while Powell-Mason runs for 1.6 miles and Powell-Hyde is the longest at 2.1 miles. The first important tip for riding San Francisco cable cars is to be aware that, as previously mentioned, these trolleys aren't like a typical form of public transportation; the trolleys attract millions of riders each year and are seen as a tourist attraction by many visitors to the city, so the act of actually getting on one and enjoying a trip around Golden Gate City isn't always as easy as you might think. It’s important to choose your times and stops carefully, and be prepared to be patient as you wait to climb aboard and enjoy the ride. If you're riding the San Francisco trolleys to enjoy the view and simply appreciate the ride, rather than focusing on actually getting to a destination, try riding on one of the Powell lines and sitting on the side of the car facing out towards the bay. You'll get the best views this way and can really make the most of your journey, snapping some photos as you go along. It's also worth noting that when riding the San Francisco cable cars you have the choice between riding inside or outside. The cars don't move faster than 10 miles per hour, so standing on the outside is safer than it might first appear and is a good option for people who want an authentic experience and to see the city in a special way. However, it can get very windy as you go along, so be sure to wear a coat on a cool day. If you'd prefer to sit inside, that can be a fun option too as you'll get to see the grip person - the operator who helps the car run by connecting and disconnecting it from the cables - which can be very interesting, but you won't get the same sort of views, especially if the car you're riding is crowded. As previously mentioned, the San Francisco cable car system runs on three lines. Learn more about each of these lines below and choose the right one for your journey. The Powell-Hyde Line starts off in the busy area of Powell and Market and heads off towards Fisherman's Wharf, ending at Hyde at Jefferson, near Ghirardelli Square. This line is a good one to take if you'd like some views of the bay and it offers stops near major attractions like the Cable Car Museum, Union Square, and Chinatown. The Powell-Mason Line, like the Powell-Hyde Line, begins at Powell and Market and runs through to Mason at North Point. The Powell-Mason Line tends to be a little less busy in general than Powell-Hyde, so it's a nice option to choose if you'd like to ride on a less crowded car. This line is a good one to choose for locations like Fisherman's Wharf, North Beach, the Cable Car Museum, and Chinatown. The California Line operates exclusively on California Street, running from California at Market to California at Van Ness. It's the shortest line and by far the least busy. It also offers a very fun ride, going up a very steep hill and offering some super views of the city. Take this line to simply enjoy those views or stop off at Nob Hill, Chinatown, and the Financial District. Passengers aged below four can ride for free on the San Francisco cable cars, but everyone else will need a ticket. It's important to note that, unlike other trolley systems you may have used in the past, the tickets on the San Francisco trolley are only good for one ride. You can't hop off and back on with the same ticket; you'll need to buy a new one each time. Tourists and residents can, however, invest in passes like the Visitor Passport that allow unlimited journeys on the trolleys. The best way to ride and get the most value is to start at the beginning or end of each route and ride it all the way, but if you'd like to get on at a mid-way point, you'll need to stand at the stop and flag down the driver by waving your hand as the trolley approaches. You won't need to let the driver know when you want to get off, as the trolleys usually stop at all stops regardless.